This past November, GGO participated in the IUCN World Parks Congress in Sydney, Australia. This once-a-decade Congress focuses on conservation of world parks and the issues surrounding them. At this Congress, in particular, key issues and themes focused on the challenges of development and climate change—as there is increasing evidence climate change amplifies existing patterns of social inequality, especially among often-marginalized groups, particularly women, in developing countries. In the stream “Responding to Climate Change,” GGO coordinated an inspiring session that focused on the national level climate change work that we have been engaged in, or partnered with, over the past several years. This high-level session, Inspiring Leadership in a Changing Climate, co-organized with the stream leads from the US National Park Service Climate Change Response Program, included Ministers of Environment, IUCN’s Director General, and several revolutionary leaders from urban and rural community engagement to share lessons learned, challenges, and opportunities as women leaders acting on climate change. Participants at the GGO IUCN World Parks Congress: Inspiring Leadership in a Changing Climate. Speakers at the event included the Honorable Alcinda Abreu, Minister of Environment from Mozambique, who initiated change at the national level by developing the first gender-responsive national climate change strategy in coordination with GGO. Sharing her inspiration she explained that a country cannot grow without the empowerment of women and the community, and the development of a Climate Change Gender Action Plan (ccGAP) provides an inclusive platform for obtaining sustainable development and climate goals. This is a crucial step in teaching youth to develop a love for the environment in tandem with human rights and learning to protect both. Founder and co-CEO of the 1 Million Women campaign in Australia, Natalie Isaacs, passionately shared her experience in transforming from an everyday woman who consumed and wasted resources without thinking twice, until having an “aha” moment about the role women have, especially as household decision-makers, in their daily lives to build climate resiliency by saving energy, reducing wasted, cutting pollution and leading change. The session was closed by Luvuyo Mandela, Corporate Social Responsibility (CSR) Strategist for Tyathumzi Advisory and youth entrepreneur, who shared an African proverb that literally translates to “to touch a woman is to touch rocks,” that is, a solid foundation is what builds a community in trust and self-esteem. Building the leadership capacity of women, youth, and indigenous peoples offers opportunity to enhance the efficiency and effectiveness of climate change policy and actions. 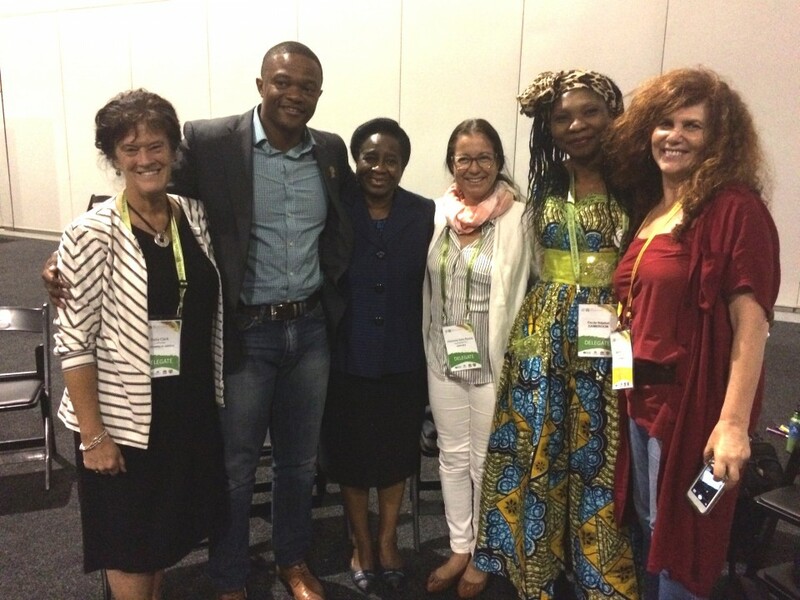 Participating in the World Parks Congress was a rewarding experience for GGO, as we endeavor to empower women globally, and, evident during this event, innovative and equitable approaches for responding to climate change are already underway in many communities.